My Chocolate Chip Cookie category is a mess. I spent 10 minutes searching for a post and picture of my favorite chocolate chip cookies from Gourmet, then realized it wasn’t there so I had to go pull it off Epicurious again.. This is a great cookie recipe and another example of why you shouldn’t always pay attention to the fork ratings on Epicurious without reading the reviews. It seems that the fork ratings were brought down by people who 1) don’t like sweet things 2) were expecting fluffy cookies or 3) didn’t think to chill the dough. There is a crazy step in this recipe and that is using 2 eggs plus 1 ¾ tablespoon of the third egg. It may sound weird, but it works. Also, the recipe doesn’t tell you to chill the dough, but if you don’t, the cookies tend to spread too much. Also, the cookies are big, so cooking them evenly is tricky. You might want to play around with cook times and cookie sizes and figure out what you like best. Here’s what the cookies look like when made with a generous 1/4 cup dough. I baked these at 350 for about 15 minutes and they came out very evenly cooked — almost too evenly. Cooking at the higher temperature made for crispier edges and gooier centers, so unless your oven is running too hot, cook at 375 as directed. I made a few more cookies using a generous 2 tablespoon scoop (half a 1/4 cup) and baked them at 375 for about 12 minutes. These baked more along the edges and had more contrast. If you do them this way, make sure you take them out of the oven when they’re still moist looking in the center. They cook internally as they sit — like this little guy. He still look a little pale, but won’t once he’s cooled down. Never underestimate the importance of standing time. Here are the tips again. #2. If you find your cookies are too brown on the edges, set your oven to 350 instead of 375 and maybe shave a minute off the cook-time. Your oven may be running a little hot. 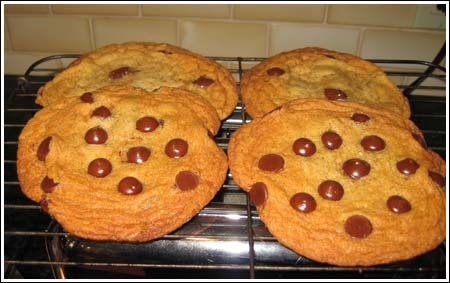 Even if your oven is not running hot, you have to really watch the cook time because these are big cookies and it’s trickier to cook big cookies evenly. #3. If you don’t want huge cookies, make the cookies half the size and don’t flatten them quite as much – just gently press the top down. Bake for a shorter time – like 12 minutes. #4. Make sure you take them out early and let them cook internally. Don’t wait until they look too dry. #5. Try using European style butter such as Plugra. A few reviewers did that and had great results. 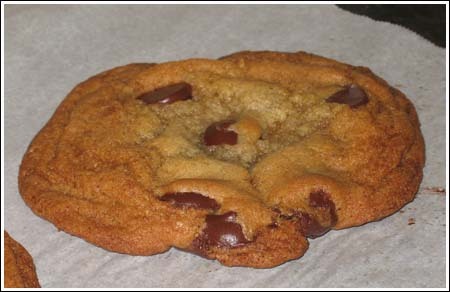 I have been looking for a chocolate chip cookie recipe like this for a long time! Finally I have found it! This is the best chocolate chip cookie recipe ever! I added toasted walnuts and dark chocolate chunks, mikl chocolate chunks instead of the chips. I baked them @380 degrees and put the trays on the bottom rack so the edges would bake first and the middles would stay more underdone. They are great! I love all your cookie information. I wanted to just make a comment for people searching for great chips in their cookies. Guittard chocolate chips are my absolute favorite brand. I think their semi sweet are actually sweeter than Ghiradelli’s and for those of you who like more bittersweet taste they have those type(s) too. I discovered your blog some time ago while searching for Sachertorte, only now did I find the time to read through some of your blog entries and recipte. I wanted to drop you a note (a virtual cookie), to let you know I admire the work you put into this blog, generously sharing your hard-won insights. Thank you! P.S. : I miss both Ghiradelli and Tollhouse morsels here in Vienna. There are some chocolate chips, but besides costing a small fortune, they do not come close the original American brands. Ok, I made these following the pointers above. I made more of a ‘monster’ cookie with semi-sweet chips, butterscotch chips, coconut, and chopped roasted pecans. These are fantastically enormous, chewy, and thankfully going straight to the office tomorrow, otherwise George and I would eat them all. Oh, those look fantastic. Too bad I made brownies before checking out the site. By the way, I did try to the Amy’s Sheperd’s Pie, so I’ll be reviewing that sometime in the next month. Early word on the street is that it isn’t worth the hype. What is worth the hype (and dairy free)? The roasted vegetable pocket. It is fantastic. That’s a good question. I had a bag of Ghirardelli Bittersweet chips lying around, so I used some of them in half of the dough. They have a distinctly different taste and are bigger than other morsels, which works well in a big cookie. Late yesterday, I went to Target and bought (along with $80 worth of stuff I can’t remember) a dark chocolate Hershey bar. I cut that up and used it in some of the same dough today. I love Ghirardelli, but I actually preferred the Hershey bar chunks this time. Another thing to note is that the cookies baked up thicker and more beautifully the second day. This is a real make-ahead dough. They sound yummy!!! Just curious, do you have a specific brand of semi-sweet chip to use for this recipe? I actually had these in the shape of your chewy but sturdy oatmeal cookies, like the picture showed. They cooked wonderfully and everyone said they loved the texture and wanted the recipe. They were a total hit last night. Thanks! Thanks for the report. I was just sitting here thinking how good those cookies were. I packed up most of them, but there’s this one in the refrigerator that keeps calling to me. I really like mine after they’ve set for a while. These are really good bake-sale material. In fact, I think I’m going to make a “Bake Sale” category.